Background: Multiparametric magnetic resonance imaging used in conjunction with ultrasound fusion biopsy (targeted biopsy, TB) results in the improved detection of clinically significant prostate cancer. 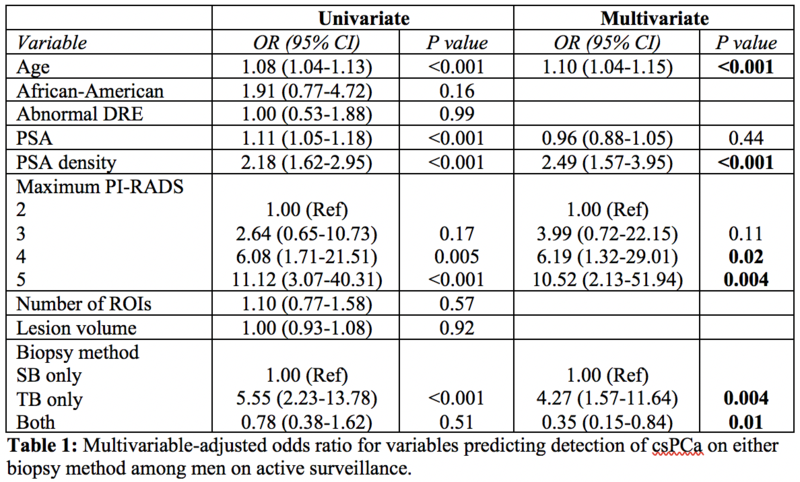 We aim to evaluate the utility of TB in comparison to 12-core systematic biopsy (SB) in detecting clinically significant prostate cancer in men undergoing active surveillance. Methods: We performed a retrospective analysis of 245 men undergoing active surveillance with both TB and SB performed. Clinically significant prostate cancer (csPCa) was defined as Gleason Score ≥ 3+4. PI-RADS version 2 was used to score ROI on a scale of 1-5 corresponding to suspicion that clinically significant prostate cancer was present and PI-RADS scores 2 and above were targeted on biopsy. We evaluated clinical and pathological factors associated with biopsy upgrade using multivariate logistic regression. Results: CsPCa was detected in 104 men (42.4%) including 40 (38.5%) by TB only, 15 (14.4%) by SB only, and 49 (47.1%) by both. TB detected a significantly larger proportion of csPCA than SB (36.3% vs 26.1%, p=0.01). On multivariate analysis, older age, higher PSA density, higher PI-RADS score, and biopsy method were significant predictors in detection of csPCa (Table 1). Of the men with csPCa, 14.4% (15/104) was detected on systematic biopsy alone where targeted biopsy failed to detect csPCA. 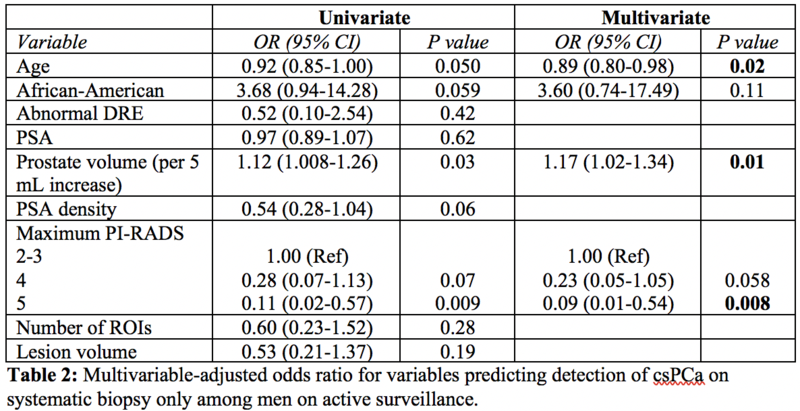 In this subset, younger age, larger prostate, and lower PI-RADS scores were significant predictors of detecting csPCa (Table 2). Conclusion: Targeted biopsy detected a significant proportion of csPCA when compared to systematic biopsy in men undergoing active surveillance. However, targeted biopsy alone may be inadequate due to a proportion of significant cancers detected on systematic biopsy alone.